← You never know when and how the Universe will give you something you need. Have you heard of PDQ? It stands for People Dedicated to Quality, and it’s a fresh fast food chain taking the South Florida market by storm. You caught that, right? Fresh Fast Food. Hard to imagine, but it exists, and PDQ has it! We had the pleasure of touring and eating at our local PDQ, and I am eager to share with you how phenomenal it is! PDQ’s menu features freshly-made chicken salads and sandwiches, nuggets and tenders, freshly-squeezed lemonade, freshly-cut french fries, hand spun shakes, even freshly-baked cookies. Did you notice a theme? Everything is fresh. No kidding. They don’t have any freezers on site. Fries are cut, salads mixed, cookies baked, and lemonade squeezed daily. Fresh chicken and turkey is delivered twice a week and stored in their huge walk-in coolers. Even their homemade dipping sauces are made every day. During our tour, manager Jennifer showed us every inch of this great restaurant, from the various prep stations to the walk-in cooler to the drive thru windows (no intercoms here, you place your order face to face!). The boys got to cut potatoes, just as PDQ employees do every morning, and we topped off the tour with the boys making their own shakes! What a great experience! And the food…so delicious!! The boys had the chicken tenders with fries, and Eric and I both had the Cali Club Chicken Sandwich. We all had hand-spun shakes, of course! We left with happy bellies, and can’t wait to visit again soon. If you haven’t tried PDQ, here’s your chance. 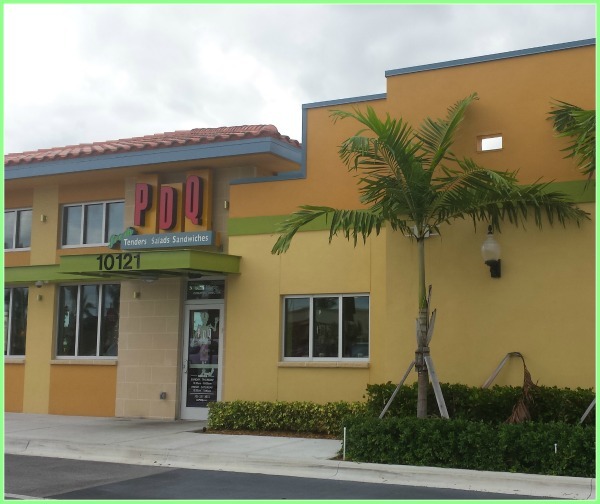 The Miami PDQ, located at 10121 W. Flagler Street in the Fountain Square Shopping Center is celebrating it’s one year anniversary, and everyone is invited!! 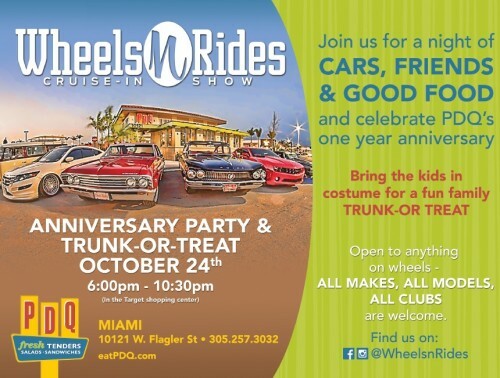 Take the kids for some Trunk-or-Treat fun this Saturday, October 24th. Come back here afterwards and let me know what you think of PDQ! This entry was posted in Around Town, Feed Me. Bookmark the permalink. 2 Responses to PDQ turns One, and you’re invited! I recently had the chance to try their chicken fingers and was amazingly impressed. I can’t wait to give their menu a try with the family, thanks for sharing all this info.